From childhood through art school, I was constantly creating, without effort it seemed; but, as I grow older I am finding it harder and harder to say “yes” to myself and my personal project ideas. Last fall, in an attempt to remedy this problem, I picked up The Artist’s Way. I poured my heart and soul into the process and it changed my life. Among many lessons I learned, the most valuable to me was how to self nurture. That realization alone has improved all areas of my life in a beautiful way. I am now mid-way through Julia Cameron’s next book in the series, “Walking in this World,” and I am finally on my way to hearing myself say “yes” again, no matter how silly the ideas appear to be. 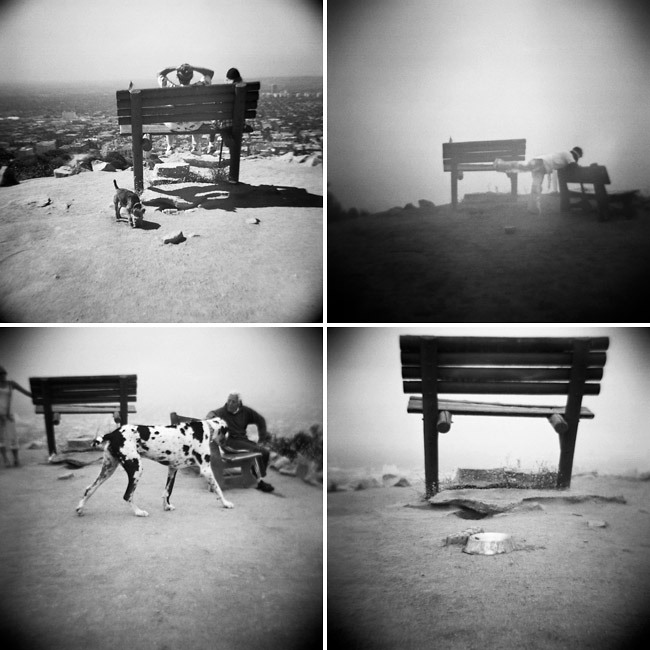 On the surface, this project is simply a visual documentation of this bench at Runyon Canyon, which is often crowded, sometimes lonely, but rarely over looked by its passerby’s. It is art for art’s sake. But, for me personally, there is another reason entirely... It’s about saying yes to the first spark of an idea, whether or not I have a clear vision for the final product, or even its purpose, and to just begin. It’s about accepting mistakes, mishaps, and mediocrity along the way and to just keep shooting as long as it excites me. Most of all, it is simply about having fun with the process of repeatedly photographing a bench with a plastic toy camera, complete with film grain, unexpected compositions, and light leaks. It is imperfect and I’m happy to be sharing my imperfect process with you. Here are the last few photographs from my first roll of film of the series. I loved that for a few days there was a tiny American flag stuck in a crevice of the bench. I loved that May 17th was so foggy; it was like standing inside a cloud. I loved that on May 19th, all I could think of as I hiked was hopefully seeing these horses again, and when I reached the top, I was instead so happily greeted by the biggest dog I have ever seen – a gentle giant, for sure. And I loved that a few moments later the bench became lonely again, just as it was when I first photographed it last year.